We've had Brit, our horse, for the past twelve years. 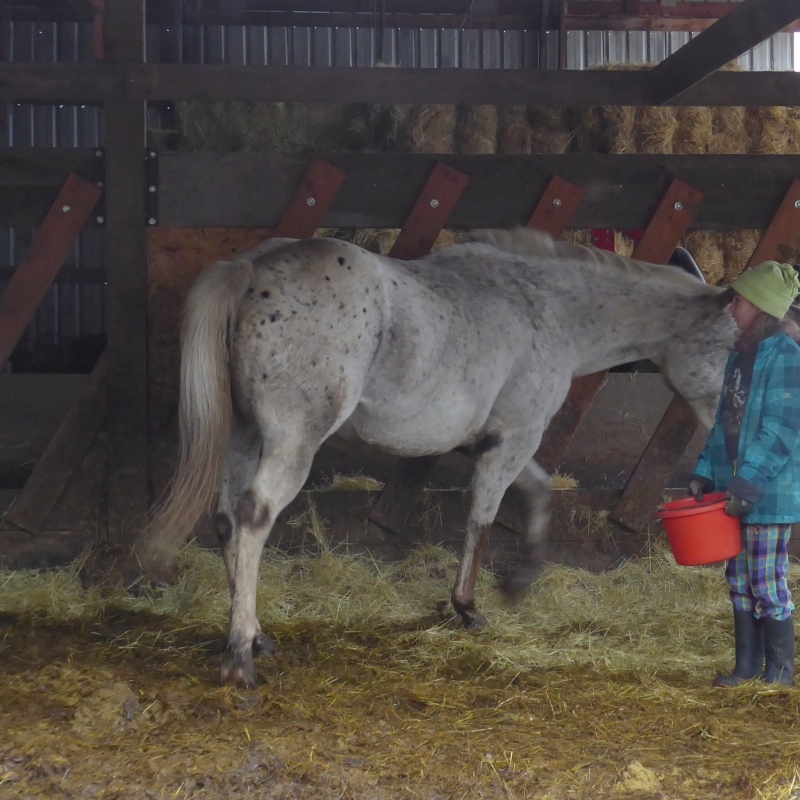 She's a purebred Appaloosa and was born on our neighbor's farm. At the time this neighbor had a lot of babies born and owed us a favor, so he gave us Brit for free. ("Brit" is Celtic for "spotted.") 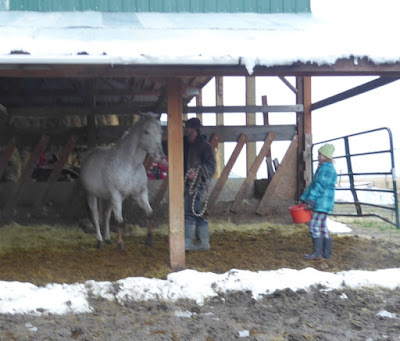 Our daughters were 9 and 11 when we got her, and we thought for sure they'd want to ride a horse. 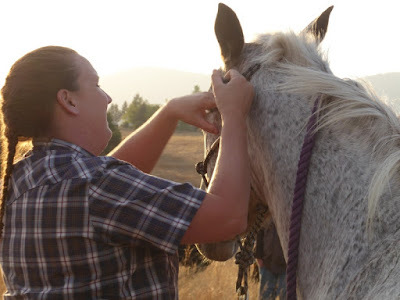 Every tween and teen girl is interested in horses, right? Wrong. 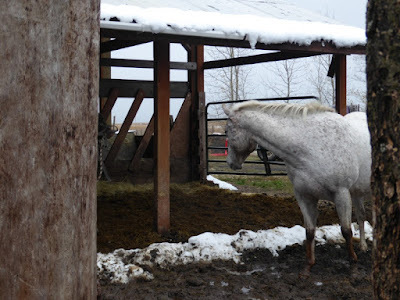 The girls just never developed an interest, and Don and I have no experience in training horses, so for over a decade Brit has been a herd-guardian and something of a pet, but nothing more. 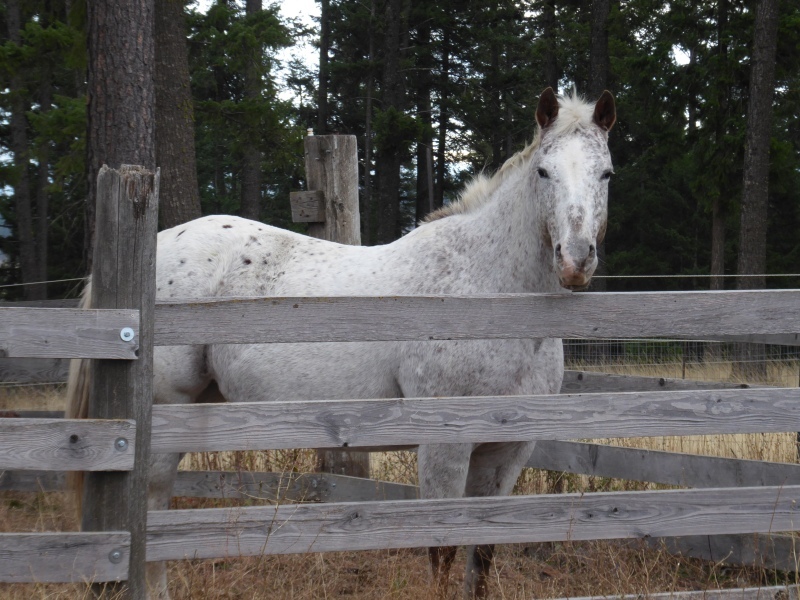 But a horse needs a purpose in life, so we've been actively looking for a new home for her with someone who is horse-savvy and perhaps has a tween or teen girl who wants to ride. Unexpectedly last week, we found such a family. A gentleman named Jason called about our cows, and when he came over (with his 10-year-old daughter) to look over our Dexters, I happened to mention Brit was free to a good home. Next thing we knew, Brit had a good home. 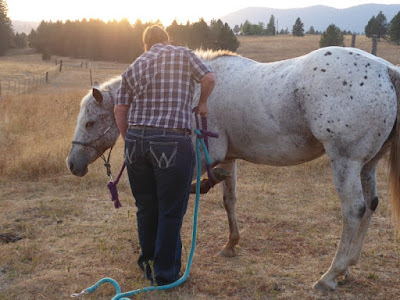 Coincidentally, a couple months ago, we had a horse expert come over and put Brit through her paces to determine how much training she would need before she would become a good riding animal. Sarah L. was truly an expert horsewoman, and it was awe-inspiring to watch her at work. Sarah concluded Brit would need about three months' of training. Armed with this information, we set out spreading the word Brit was available. When Jason expressed an interest in Brit, we were able to tell him what Sarah had said. 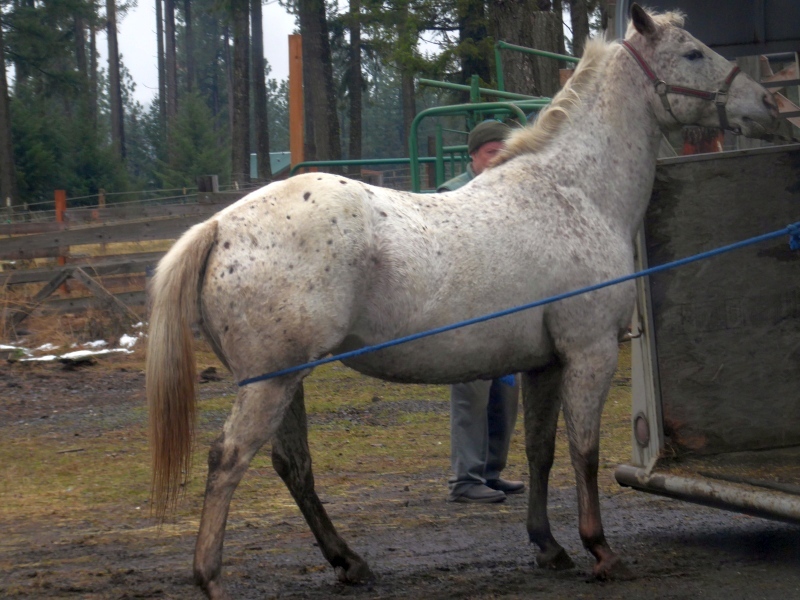 When Jason came to pick her up, Brit acted skittish and wouldn't let him put a halter on her. But shucky-darn, the 10-year-old daughter just happened to have a bucket of oats with her which proved irresistible. With some patient coaxing and firm handling, Jason soon had a halter and lead rope on Brit. 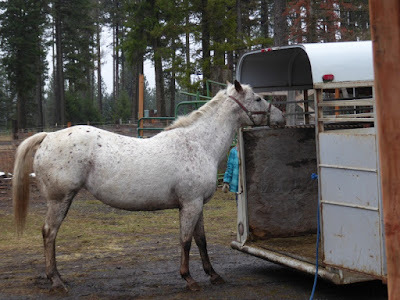 Then came the next challenge: loading her into the horse trailer, a gizmo she had never seen (from the inside) and didn't like. She took a bit of persuasion to go in, but the rope trick worked like a charm and she loaded without a problem. 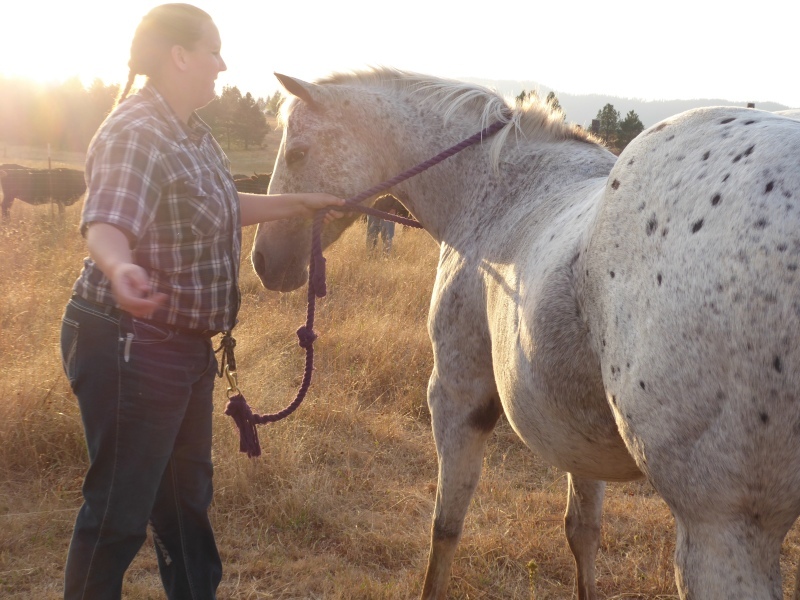 So now Brit is gone, living with a horse-loving family who will be able to train her as a horse should be trained, complete with a darling little tween girl to lavish her with affection. We don't miss Brit, exactly, except for certain odd moments here and there. For example, every morning when I stepped outside to do farm chores, Brit would inevitably spot me and whinny. For years I've played a little game with her. I would step outside and say, "Frau Blücher!" If Brit whinnied before I said that, she won. If she whinnied after I said that, I won. So I can no longer play my little "Frau Blücher" game, but it's a small price to pay for giving Brit a useful, purposeful life. Goodness,I've read your blog for quite a while now and never realized part of your cattle herd were Dexters! I knew you had Jerseys but didn't realize the other breed was Dexters. We are newbie owners since we just brought home two heifers. One is a 12 month old Dexter and the other is a 6 month Dexter/Jersey cross. 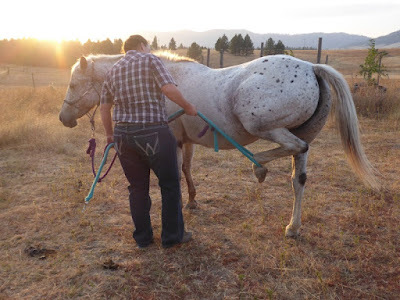 We recently did the same thing with an adopted mustang mare, who had a henny she took for a buddy. They are both with a loving family that can treat and use them as intended. Glad Brit found a good home. Now if you just get rid of some of those cows, you can try....Sheep! LOL If you ever do, I will point you in the right direction! Judy down in Yuma, warm, sunny, Yuma. Frau Blucher! Love that movie and the joke! Wow, Patrice. I've been reading for years, rarely said a thing. Kudos to you for being selfless enough to give Brit her golden years.